Floodwaters from Hurricane Florence are beginning to recede in North Carolina, and CommWell Health staff at a mobile clinic in Harrells, North Carolina, are bracing for an influx of patients. Those expected to pass through the mobile clinic’s doors may have been unable to get care since the storm’s waters rose last week, and may have had to leave their homes at the last-minute. CommWell Health received emergency medicines Wednesday from Direct Relief to stock its mobile unit, which will provide care to the community while many services are still closed. Insulin to manage diabetes is often a critical need in emergencies, and on Wednesday, Direct Relief shipped insulin to three different health facilities in communities affected by Hurricane Florence. Those clinical facilities included NC MedAssist in Charlotte, Advance Community Health in Raleigh, and HealthReach Community Clinic in Mooresville. Direct Relief also received requests for insulin from Scotland Health Center in Laurinburg and Health Quest of Union County in Monroe that will be fulfilled in the coming days. Direct Relief is also shipping meters, strips, and lancets, as well as other diabetes management supplies like sharps containers, needles, syringes, glucagon and glucagen and glucose shots. When mass evacuations occur, chronic conditions can escalate, forcing a person to seek emergency care. Without a regular supply of management medications like insulin, dire consequences can occur. In response to these needs, Direct Relief developed a Hurricane Preparedness Pack, many of which are stationed each year in hurricane-prone communities. These kits were developed based on feedback from healthcare professionals responding in past disasters and have been refined over time, based on what first responders are most likely to need during an emergency. Each contains medicines to manage diabetes, high blood pressure and asthma. Direct Relief also ships requested amounts of insulin, which must be stored at a constant cold temperature. 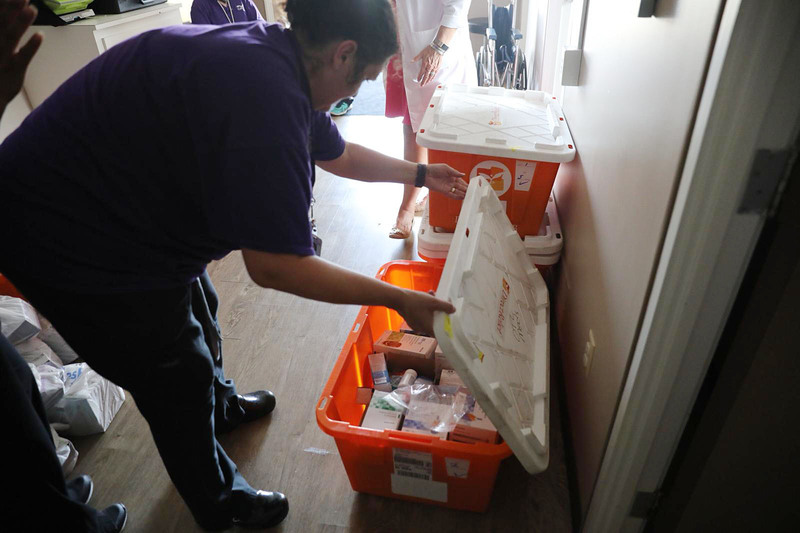 From the organization’s 2,800-square-foot cold storage room, staff packed insulin for shipment Wednesday, medication that was donated by Novo Nordisk and designated for patients in North Carolina.